December is here, it came so fast, I feel that it almost arrives faster every year. Perhaps, many more commitments this year, less time to pause and reflect. But then, the Christmas time and its spirit is so magical, that I find it hard to complain that the time passes so quickly, almost unnoticed. I discuss with the Dégustateur our possible plans for this particular time far in advance, but somehow all those months seem to fly. The most visible reminder of Natale awaiting just around the corner are Luci di Natale (the Christmas lighting) and the shop window decorations in Rome. Here the preparations towards Christmas start a bit later than what I became used to in the past. London has always done a wonderful lighting display that already starts in November. The shops and department stores go to extremes to catch the attention and quite rightly they deserve to get it. In Poland on the other hand, for my family and myself, it is when you hear on the radio for the first time the “Last Christmas” song by Wham!. From that moment the festive buzz officially commences. Despite the fact that there are so many errands to run and the to do lists prior to the festivities, we all happily embrace this special period and look forward to sitting down together at the table on Christmas Eve. In Poland Christmas Eve (Wigilia) is a big event, it has a special meaning for us with the aura of the christmas tree and the table set with an extra plate for an unexpected hungry guest. What I love about Natale is the cosy atmosphere and the time we have at home. I plan what to cook, which I adore, prepare a shopping list which I try to follow. I can get easily distracted by the festive treats: chestnuts, chocolate, seafood, first tarocco (blood orange) of the season and all the flavour combinations perfectly suitable for Christmas. Artichokes are a big thing in Rome. You can have them alla romana, alla gudia, alla brace, marinated and so forth. On this occasion I am thinking of having them cooked in olive oil, white wine and water, just following Elizabeth David’s recipe (carciofi alla veneziana). We will feast on creamy burrata with anchovies and octopus. Many years ago (about 16) I spent a year in Spain, in Galicia, the region known for the best seafood in the country. There I tried for the first time pulpo a la gallega, a tender sliced octopus served with olive oil and generously sprinkled with piminetón. There will be deep purple coloured radicchio with aged balsamic vinegar, it always calls me when I am at the food market “take me home” and mostly I can’t resist. We will have a pasta dish with seafood. Last year I prepared spaghetti with prawns and artichokes. I actually created this dish on the spur of the moment. I am very lucky and I don’t take for granted the fact that the Dégustateur genuinely appreciates and gives me full liberty to cook what I wish to make, not only for Christmas. This year we will have spaghettini with langoustines, fresh tomato and rocket salad. A new inspiration from our frequent visits to magical Venice. Surely we will find space for a grilled turbot or sea bass baked in salt. I do respect that for the Dègustateur, being British, the Christmas Day lunch is of a greater importance to celebrate. In the morning panettone is a must to start the day. Probably still in pyjamas. Because why not. After that we usually go for a walk around Rome, the city is much quieter with smaller numbers of tourists, we can really enjoy its beauty and history, but we also prepare our stomachs for a late Christmas Day lunch. I will be roasting a guinea fowl stuffed with chestnuts and black truffles (I order the bird a few days in advance with my butcher to skip the pre-Christmas chaos). I’ve just started reading a memoir about an American food journalist leaving her life behind and moving to Venice. After the first twenty pages I stumbled upon a recipe for pasta with walnut sauce. I am so glad that I’ve come across it because I’ve been meaning to make a similar one for a while. Moreover, it appears to match perfectly the festive atmosphere, perhaps because it calls for Vin Santo or Moscato as its substitute. Tagliatelle pasta con salsa di noci will make a delicious starter for the roasted guinea fowl. Christmas calls for “my chestnut pavlova”, a cake that I created for a charity event in Rome a few years ago. Meringues are crunchy and golden from the outside but soft on the inside. There is a chestnut cream in the middle and the top layer of the pavlova consists of a generous spread of Chantilly cream decorated with marron glacés and grated dark chocolate. There might be torta caprese (flourless chocolate and almond tart) and baicoli with Marsala zabaione (a Venetian treat) on the list. Italian desserts are not very elaborate, they are simple and delicious especially when made with love and care. There is always wine, red wine and a glass of bollicine to start with. Usually we have a bottle of a more important wine or one that is somehow more special to us. I open it a couple of hours in advance to let it breathe for a while and to offer us its full potential. This is our way and the recipe for a comforting Christmas time, a tradition that we wouldn’t change. 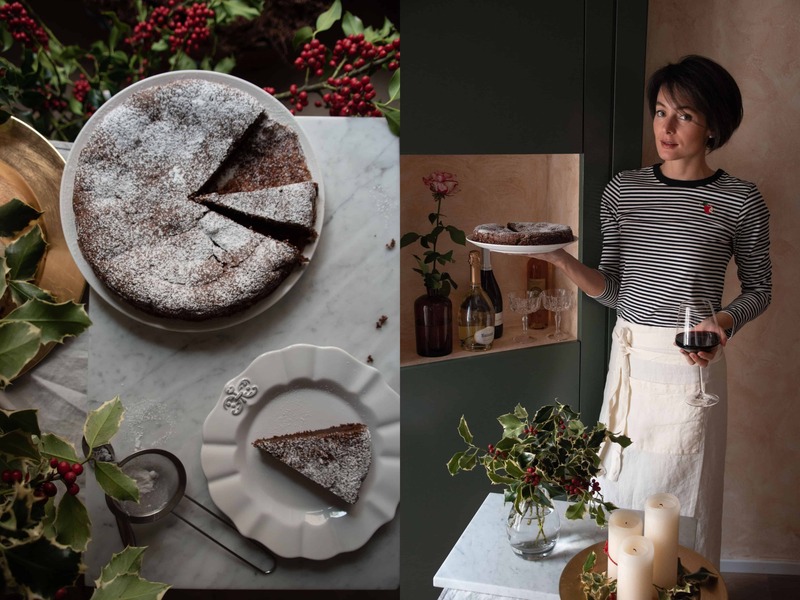 Nothing really needs a lot of time to be spent on the preparation, the cakes or tarts (apart from zabaione) can be made a day in advance, so you just decorate them moments before serving.